Yum! Brands (NYSE:YUM) , parent company of KFC, Pizza Hut and Taco Bell and one of the top 100 Corporate Citizens by Corporate Responsibility Magazine in 2014, announced the release of its online 2014 Corporate Social Responsibility (CSR) Report. Yum! Brands is listed on the 2014 Newsweek Green Rankings and participates annually in the Carbon Disclosure Project. The Report provides a global view on the progress Yum! is making towards its goals and tracks performance across four strategic areas of focus: food, people, community and environment. Also featured are success stories from the Company’s brands around the world presented in interactive, info-graphic-style and video formats. Yum! Brands believes that all of its food can be part of a balanced lifestyle if eaten in moderation and balanced with exercise. The Company is making progress on three pillars: more choice, more transparency and improvement to ingredients. By the end of 2015, Yum! expects to reach its goal of having 15 percent of its meals at one third of the recommended daily allowance (RDA) in each country where it operates. By 2020, the Company’s goal is to have 20 percent of its meals at one third of the RDA. Each of the Company’s brands has introduced products that are lower in calories and fat, such KFC’s Kentucky Grilled Chicken, Pizza Hut’s Skinny Slice Pizza and Gluten-Free Pizza and Taco Bell’s Fresco Menu featuring six signature items that are each under 350 calories and 10 grams of fat. KFC, Pizza Hut and Taco Bell provide nutritional information in their restaurants and online. The Company was the first to call on Congress to enact uniform national menu labeling as well as one of the first in the world to eliminate artificial trans fat. The Company is also actively reducing sodium across its menus globally. Yum! Brands has created a unique people-first culture centered around reward and recognition to drive results. The Company is recognized as one of the 2014 Aon Hewitt Top Companies for Leaders(R) in North America for its comprehensive leadership development programs and practices. In addition, Chief People Officer Anne Byerlein was recently named one of Forbes‘ Top 10 Chief Human Resources Officers. Yum! wants to make learning and career development accessible to as many of its 1.5 million associates around the world as possible. Through Yum! University, the Company’s worldwide learning and development platform, associates have completed over 35 million online courses in the past few years alone. In the U.S., the Company provides salaried associates with tuition reimbursement opportunities. Through Yum!’s Andy Pearson Scholarship Program, the Company has awarded approximately 2,500 scholarships and nearly $6 million in grants to associates since 2003. Yum! Brands believes its greatest contribution is making food accessible to the less fortunate. In 2007, the Company created World Hunger Relief in partnership with the U.N. World Food Programme and other hunger relief agencies. Since its inception, World Hunger Relief, the world’s largest private sector hunger relief effort, has raised and donated more than $600 million in cash and food donations providing 2.4 billion nutritious meals for those in need. For more than 20 years, the Company has been committed to solving hunger in the U.S. through its Harvest food donation program. Each year, its restaurants donate more than 10 million pounds of food to partner agencies nationwide. Harvest has grown into the world’s largest prepared food donation program, contributing 173 million pounds of food to over 3,000 nonprofit organizations in the U.S. The Company is continuing to expand Harvest globally this year. 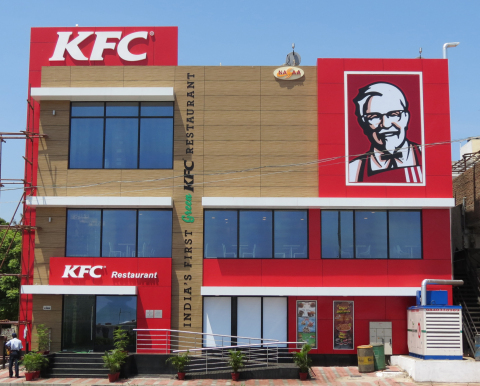 In the U.S., the Company’s brands give back with programs that focus on college scholarships through the KFC Foundation, reading incentives through the Pizza Hut BOOK IT! (R) program and mentoring at-risk teens through the Taco Bell Foundation for Teens. Yum! Brands is focused on green building design, energy and water reduction, environmentally preferable packaging, supplier environmental audits and minimizing waste within its stores through increased efforts in oil and cardboard recycling and food donation. Yum! has over 4,200 restaurants that include sustainable building solutions. In addition, the Company has over 30 LEED certified restaurants built or underway across nine countries, the second highest total among restaurateurs. Its LEED certified buildings incorporate elements such as recycled building materials, solar panels, LED lighting, low-water fixtures, energy monitoring control systems, high efficiency air conditioning and heating systems, more efficient kitchen equipment, among other examples. By the end of 2015, all of Yum!’s new company-owned stores will be LEED certifiable. Yum! is also on target to reduce energy consumption in its company-owned restaurants by 15 percent by the end of 2015. It has eliminated the release of almost 1.2 million metric tons of CO2 since 2009, the equivalent to removing 225,000 cars off the road. New this year, the Company has committed to source 100 percent of its palm oil for cooking oil from responsible and sustainable sources by the end of 2017. For more information and to view Yum! Brands 2014 CSR Report, visit www.yumcsr.com. Join the conversation at Facebook.com/yumbrands and @yumbrands on Twitter using the hashtag #CSR.